Visit every marketing forum, Q & A and you will find one topic that is common and in many instances, most discussed. The effectiveness of email marketing. The below statistics will tell you why email marketing is gaining traction. To achieve or go beyond the above statistics, you need to design an attractive mail that is guaranteed to be opened by prospects. 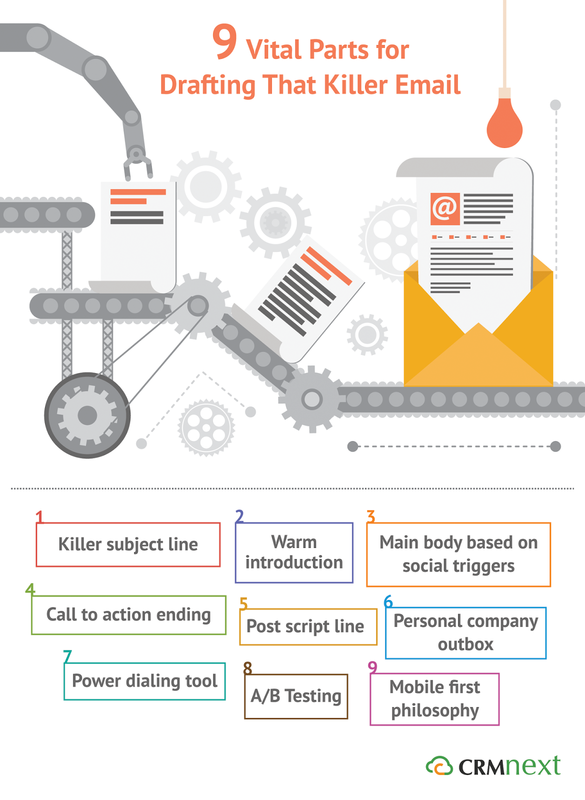 Here’s nine vital parts for creating that awesome email. This may seem obvious. So obvious that around 90% of email marketers ignores it and sends mails with dull headlines. Result? Mark as spam. You should create headlines that include Adjective + Trigger Word + Keyword + Promise. This will ensure opening clicks, from where you can direct user interaction. Don’t just jump into product pitching. Take time to work on the target audience pain areas and accordingly, draft an introduction. You can gather intelligence through industry research and surveys. Social media can give you a plethora of information with regards to customer preference triggers. You can use a social CRM solution that gives you keywords (based on monitoring customer or prospect feeds) that you can use to attract attention. Call to Action is the last but the most important ingredient of a great email. The way you draft your CTA determines whether guiding the user through the email was worth it. It should be crisp and clear with regards to next best action for the prospect. In order to show personalization, it is a good habit to add Post Script (P.S) lines at the end of the mailer. Personalize it with the prospect’s name, preferences etc. But never overdo this or it may backfire as lack of professionalism. Always use a personal company outbox while sending out mails. This reduces chances of being automatically being dumped in the SPAM folder. It also establishes veracity of mail origins. With most of the communication today happening digitally, it is a good idea to include a powerful dialing tool that will enable the prospect to make a virtual call instantly. It can be in the form of Skype or custom widgets. Always have two different samples of email draft to undergo A/B Testing. Select a sample size at first and based on the response rate, pick up one to officially mass mail. This way, you will increase the chances of conversion success. Whatever you do, make sure it renders on all digital platforms, especially on mobiles. Almost 82% of consumers today open their mails on mobiles. Frustrating them with poorly rendered mails is a given way to damage business goodwill. With the above nine parts added up, your email will be the bait with which you can hook a prospect. To know the CRM solution to create that perfect mailer, click here.